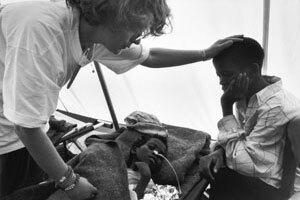 Volunteer Els Adams was project coordinator for MSF during the terrible famine in post-war Angola. Not a very good start to the day. Alice, the critically ill ten-year old girl who was brought in by her father yesterday, died this morning. Alice arrived yesterday evening with her father. Marjan, one of our nurses, and I were still in the hospital, where Médecins sans Frontières (MSF) has a unit for seriously malnourished children. The father, wearing only rags, was barefoot and had nothing with him except his daughter. He had walked through the bush for four days with Alice on his back. She was in an advanced stage of malnutrition; her whole body swollen with oedema. Her father and his family were kidnapped years ago by the rebel movement, UNITA. On arrival, he told us they had spent all that time as prisoners in the bush. Last night he looked at Marjan and pleaded, "Please do everything to save Alice. She's all I have left." From his rags he pulled out a photo of himself and his family - a young, healthy woman and six radiant children in their Sunday best. His wife and five of the children had already lost their lives. This morning Marjan and I were devastated when we heard that Alice hadn't made it. Now that the rebel leader Jonas Savimbi is dead and the peace process has started, more and more people are emerging from UNITA army bases in the bush. Our feeding center is swamped with severely malnourished children. Today, we decided to send a car to Cambondo, the arrival point for people who have sometimes been walking for days on end. When we left, my car was full of women and their malnourished children. I listened as they told me how they have been kidnapped - some at a very young age - by the rebels and 'handed over' to a UNITA soldier. "Couldn't you choose your husband?" I asked. They laughed at my naivety. One woman had buried her four-year-old along the road the day before. She described it without any visible signs of emotion. Her family had been living on leaves and raw manioc without salt or oil. They told us about all the people who are still en route, some too ill and malnourished to walk. When we got to the feeding center I brought the women and children to Marjan, who, together with the other nurses, started weighing and measuring them and administering the first drops of milk and medication. In the first phase of the therapeutic feeding program, all the children get is milk that has been specially prepared for serious malnutrition cases. They get it eight times, spread over 24 hours. The quantity is based on the weight of the child. I notice Marjan was looking tired. A sleepless night. I can feel the effects of the increased workload. Our feeding center is becoming overcrowded. I've been communicating to the MSF headquarters in Luanda the need for another feeding center. Fortunately, they gave me the go-ahead today and Luis, my Angolan logistician, and I started looking for suitable premises. We found an old warehouse, struck a deal with the owner and started planning the preparations. Latrines need to be dug. We need a water tank and a kitchen and mats to sleep on. We also need to work out our requirements in terms of food and medical supplies, cooking utensils, crockery, registration wristbands, firewood, candles etc. Protocols and recipes need to be copied. And then there's the staff, of course: nurses, cooks, nutritional assistants, guards, a cleaner and a supervisor. We reckon that we need around three days. In the midst of widespread euphoria about the peace process, we are starting to realize what went on in the bush during the years of war. People who have barely survived the violence and lack of food are emerging in the thousands. The demobilization of the UNITA troops is part of the peace process. They are being concentrated with their families in special areas. There are two demobilization camps in Malange Province. None of the aid organizations have been allowed in so far. At three o'clock I received a radio message asking me to go to the hospital right away. It sounded urgent, so I jumped into the car. At the entrance to the feeding center I found a large group of seriously malnourished children - ill, scabious, some with ulcers, naked or in rags, often with a mother who looked just as bad. An army truck had brought them from the demobilization camps. The driver opened the flap and dropped them at the door of the already overcrowded feeding center. Our nurses had already started the registration procedure under the trees. I had to think fast. Our feeding center was already bursting at the seams; there was no room for as much as a single child and our new center was still to be organized. I told the staff to prepare milk for the children and decided that we will have to open our new center right away. Everyone started rushing around. Cars ferried food and goods from the MSF warehouse. The staff was warned that they would have to start working immediately. Don't ask me how we managed it, but by six o'clock we took the first batch of children to the center and at seven they were sitting drinking their milk. The whole team, including the national staff, worked throughout the evening. I am quite sure all of us collapsed, totally exhausted, into bed, plagued by dreams full of malnourished children. But we have our new feeding center and I am proud of my team. Nobody slept well. There is so much that still needs to be done to get the new feeding center up and running. Today I didn't have time for a break. I was busy organizing and arranging things, while Marjan screened the children individually. In the evening we stopped for a bite to eat and to swap experiences. Everybody was shaken by the stories and the suffering. Again it was confirmed that just as many people are still in the bush, and in an even worse state. Help will come too late for them. And again, it happened that almost all the mothers we spoke to have recently lost one or more children. One woman told me she lost four children in the month of April. Her two remaining children are in bad shape and I doubt if they will make it. Another woman buried her eighth and last child a few days ago. There are just no words for the suffering of these people. Getting access to the demobilization camps becomes more and more of a priority. But this could be awkward, as they are in military territory. Today, however, everything started moving when I was invited to a meeting at the military headquarters. The commanders of the government army and UNITA were sitting together in a brotherly way. They invited us to visit the camps so that we can provide relief. We got the green light at all levels. It helps when the request comes from both sides. As yet, the UN has refused to enter the demobilization camps because the national government has not submitted a formal request for aid. I dropped by the feeding center this afternoon. I saw children, whose eyes only a few days ago were closed by oedema, starting to look around again. Few jobs are as rewarding as this, with such visible results. We can't save them all, but I know that gradually, most of them will change from sad, apathetic, sick children into lively and happy ones. I am sure that waiting to see this happen is what has been giving the team such energy and satisfaction. At 9am we left for the demobilization zone, about 50 kilometers away, driving past the burnt-out remains of trucks. Only a few months ago it was impossible to drive here because of the risk of mines and ambushes. The last 15 kilometers took us right into the bush where we saw people building huts from grass leaves and bits of plastic. These were the UNITA soldiers and their families. We were officially welcomed by a delegation who said they were in desperate need of our help. Children are dying every day. The army sends food for the troops but none for the women and children. The children were waiting in a long row. I couldn't believe my eyes - so many children, each one in a worse state than the next. Enough to fill a couple of trucks. While I was distributing passes that would help the children get into our food center quickly, one child died. I had given him a pass only a half-hour before. Our truck was filled to overflowing. We needed to get back as soon as possible to pick up more children. We radioed ahead that we were on our way, so the team would be ready to take charge of the children. Already, only three days after we opened it, the new feeding center also is filling up. Tonight I tuned in to the Dutch World Service. I heard reports of political wrangling surrounding the upcoming elections and a general sense of dissatisfaction in the Netherlands. Sometimes home seems very far away.